WWCC - Nalchik 2008 - and now there are just four! A veteran playing some of here best chess and a player long expected to reach the heights meet each other in one semi-final while the two super talents (inlcuding the top seend and hot favourite) who are seen to be the future of the game meet in the other semi-final. 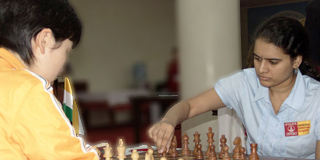 Do go to the official website nalchik2008.fide.com for just about everything you want to know - results, stories, pictures, and games, and visit the official media partner www.chessdom.com for live commentary.